Andrew Cameron knows how to train athletes, especially special needs individuals and Special Olympics athletes. He recently started a new organization – Built on Bravery – to help them become the very best they can be. 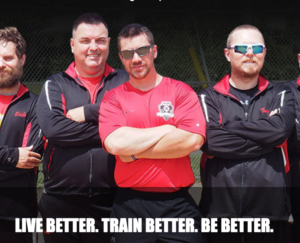 Built on Bravery provides individualized personal training and more focused Special Olympics coaching that helps clients meet their health and fitness goals. They can take engage in person at Built on Bravery’s Eden Prairie, Minn., facility, or online if they don’t live in the Twin Cities area. Andy’s mantra is “Believe It, Achieve It!” and that’s exactly what he helps his athletes do. He believes in “any body,” meaning Built on Bravery’s science-based health and fitness programs are built on the conviction that every individual has the potential to get stronger, healthier and happier regardless of any perceived limitations. Built on Bravery athletes learn how to eat right, lose weight, gain weight, build strength, tone muscles and improve skills in everyday life and their chosen sports. “They just need the courage to try, and we’ll guide them the rest of the way,” Andy says. munications. Nubson took care of Built on Bravery’s website and design work, and I handled the copywriting and content creation for several marketing and public relations pieces. Since the beginning of our relationship, I’ve helped Andy with copywriting and content creation for a sales flyer, a press release, an email to coaches of special needs athletes, a letter to education professionals who work with special needs individuals and a script for introductory video on the Built on Bravery website. You can help special needs individuals, Special Olympics athletes and Built on Bravery by checking out its sales flyer and website and directing special needs individuals, their parents/guardians, coaches and teachers there, as well. It’s been a pleasure working with Andy because he is pretty special, himself. While he doesn’t have Autism, Cerebral Palsy, Down Syndrome or any of the other conditions that his clients deal with every day, he’s dedicated himself to seeing them prevail. And in my book that makes him very special, indeed.